I often entertain the thought of living in a baroque style apartment in one of those really hip arrondissement in Paris. There's just one problem. My ability to speak French. I'm rather proud of my attempts but I've seen many Parisians who had the misfortune to converse with me winced in pain...... Le sigh. Ella is English but interned at Baron Baronne in Paris in 2010. She's only 21 and already has an impressive resume which listed her work with Diane Von Furstenberg, Erdem and Velour magazine. She's been featured in Vogue, Harper's Bazaar, Marie Claire, Evening Standard, New York amongst many other fashion bigwigs. Check out her interview with Paula Reed, the former editor in chief of Grazia, now the Fashion Director of Harvey Nichols, a must read for those who wants to get into the fashion industry. Camille is a 31 year old Parisian with a weakness for French hip brands such as Isabel Marant, Maje, Sandro and Zadig et Voltaire. She has the effortless casual, luxe-boho style which I love. Never too perfect but unbelievably cool that you just want to emulate her outfits. Stephanie and Allison are the duo behind the hysterical La Mom, or perhaps I should call the blog le Moms. There's never a dull moment with these two ladies who have been blogging about their adventures living in Paris for years now. Their acerbic witty posts will crack you up. That's a promise. I saw Ella everywhere during NY Fashion Week. She's so dainty and cute! Oh Camille is so chic... le sigh. I couldn't copy that style if I tried! Love these recommendations - have been having a read through already. Wow! 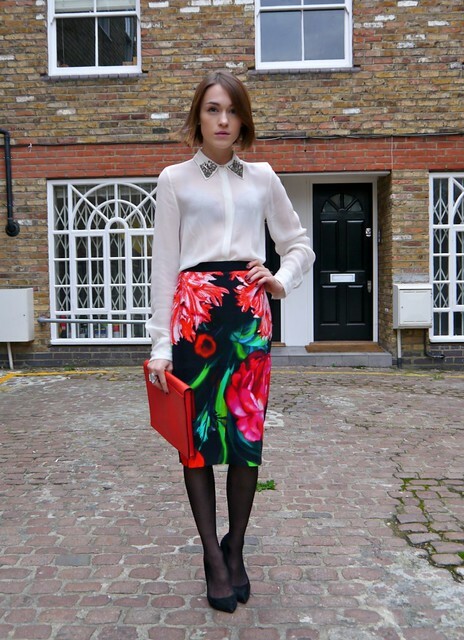 Ella looks like Keira Knightly, love the richness of that floral skirt with the elegance of her blouse - beautiful! loving these blogs - especially elle's! I'm glad I'm not the only one bad at French, after many years of being forced to learn it at school I am pretty good at spelling, writing & putting sentences together in my head, but my pronunciation is beyond terrible, so I never try to speak it! Looking forward to having a look at all of these blogs, especially Ella's blog and La Mom - sounds like I'm in for a treat!